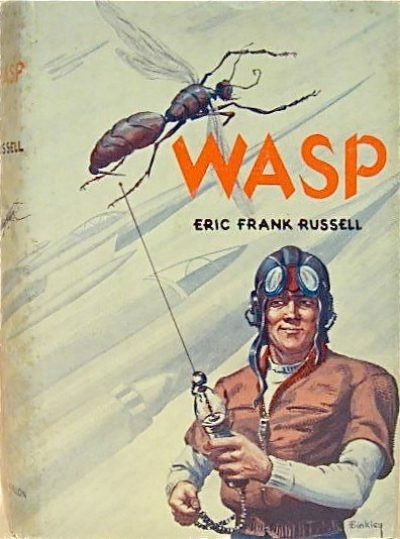 Eric Frank Russell’s 1957 Wasp is a standalone science fiction novel. Terra and the Sirian Combine have been at war for a year. Humanity enjoys a significant technological edge, but the Sirians outnumber the Terrans ten-to-one. The solution, as far as Terra’s High Command is concerned, is to adopt tactics in which the weight of numbers cannot come into play. James Mowry is given an offer he cannot refuse. He is to become a wasp. Just as a wasp flying into an automobile can distract a driver to the point of a fatal crash, so too can one man in the right place at the right time distract an entire military apparatus … possibly neutralizing it. Raised in Sirian space, Mowry speaks Sirian like a native. With skin dye and a little cosmetic surgery, Mowry passes as one of the enemy. He is dropped on the backwater world Jaimec, along with mucho supplies. He is to spread chaos, fear, and dissent, all of which (it is hoped) will distract the Combine from the war effort. Mowry is one man. Against him is the entire Kaitempi security apparatus. The Kaitempi are a secret police force with wide authority. Every person on the planet must carry up-to-date identity papers; everyone is subject to search whenever a passing Kaitempi feels the whim. Open dissent is harshly punished; informants are everywhere. This heavy-handedness amplifies the effects of Mowry’s distractions. Minor acts of resistance — pasting anti-war posters on shop windows, for example — attract over-the-top responses from the Kaitempi. The Kaitempi don’t particularly care if the people they punish are actually guilty. Mowry doesn’t have to do much to make the lives of the people on Jaimec even more miserable. To this he adds a small but carefully targeted terror campaign, which generates far more official paranoia than the modest body count would justify. Mowry claims credit in the name of the entirely imaginary Dirac Angestun Gesept (Sirian Freedom Party). As there are no actual members of the Dirac Angestun Gesept as such, Mowry hires local criminals to carry out targeted assassinations. Of course, Mowry has to get lucky each time he strikes at the Combine. The Kaitempi only have to get lucky once. “We first dug out about sixteen thousand completely fluent speakers of the several Sirian dialects. Eliminating the females and children brought the number down to nine thousand. The author (Eric Frank Russell, henceforth EFR) modeled Mowry’s efforts on dirty-trick campaigns mounted by the Allies in WWII, efforts to soften up regions before the actual military showed up in force. EFR also drew on certain characteristics of the Axis powers in WWII, in particular the use of secret police to monitor the masses and crush dissent. It is probably in no sense coincidental that Kaitempi sounds an awful like “Kenpeitai,” Japan’s military police. Now one might expect that the author would claim that the Terrans are winning because the Sirians languish under an authoritarian government while the Terrans enjoy good old democracy. That’s true of a lot of Golden Age SF. But there’s no such trope in this book. There are a few references to elected officers amongst the Sirians. We are never told how the Terran government is selected or run, but we do know that Mowry isn’t given any choice about risking his life behind enemy lines. This is a cheeky terrorist how-to book. It’s an entertaining tour of just how much disruption one determined individual can cause. It can be fun because even though it’s likely that most of Mowry’s victims are innocent bystanders, the novel only shows him offing assholes who deserve it. Ah well. Omelets, eggs. There’s a war on, so anything goes2. It may be that readers who have more recently been targeted for disruption (by terrorists or their enemies) might find Mowry’s antics less amusing. In that case, they might find this old classic of interest as a primer for resisting disruption. It’s easier to resist if one can recognize agents provocateurs. Wasp is available here (Amazon), here (Amazon.ca) and here (Chapters-Indigo). 1: Spakum = “bed bug” = Terrans. Terrans call Sirians “blowflies” because their skin tone means they have blue bottoms. This fellow told him that Shugruma was practically wiped off the map. Not one stone left upon another. Three hundred thousand dead. The stench of bodies would turn your stomach. He said the scene is so awful that the news-sheets daren’t describe it, in fact they refuse to mention it. Kaitempi = Kempeitai? I'm not sure if that makes it better or worse.